A Canterbury lure rod is a type of heavy fly rod about ten feet in length. A large capacity single action fly reel is used to store the heavy monofilament line used instead of a conventional fly line. The reason for the heavy mono (30-40lb) is so that it doesn’t cut into your fingers. To the end of the mono is attached a lead weight and swivel arrangement, and to this, about 2 metres of lighter mono (say 10-15lb) is connected and the lure or fly tied at the end. Here are the typical terminal rigs used with the Canterbury lure rod. The rod is quite specialised because it must have a slow action to be able to cast the heavyweights, of around 2 ounces, slowly enough without tangling the long leader. 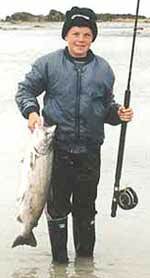 The rod must also be powerful enough to fight 40 pounds of angry salmon intent on heading back out to sea. 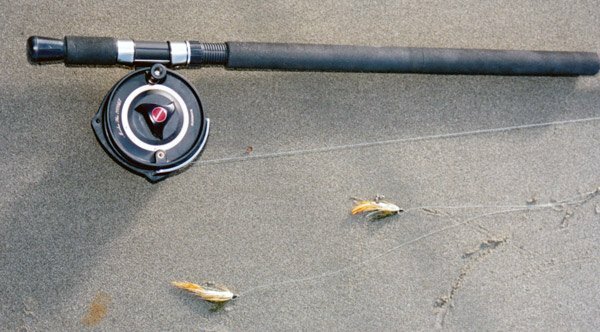 The reel must have an equally strong drag system to sustain a potentially long and sustained fight between angler and fish. At the same time because much short casting is involved the whole must not be excessively heavy. The Canterbury lure rod has had much bad press over the years. I believe there are several reasons for this. Firstly, it is a method that can be used in narrow channels, and milky water, where there is a good chance of foul hooking fish. It is also true that there is probably more likelihood of foul hooking with a lure rod than a Zed spinner. If a salmon is foul hooked it is soon obvious. Instead of the typical head shaking, nodding, and solid heavy pull, (not unlike hooking a floating log with its own outboard) a foul hooked fish is far more likely to perform acrobatics, and shoot up out of the water. It will most likely be side on to the line it will be very difficult to play and lead, and so will take a long time to bring in. In this situation, it is best to simply tighten up on your line and break the fish off. It is better to try to hook another legally in the mouth than to waste an hour playing a fish you are going to have to release anyway. Some “scoundrels” have given the Canterbury lure rod a bad name by not breaking-off foul hooked fish and releasing them but instead keeping them. Worse still is the quite illegal practice of shortening the leader and ripping the fly across the current in a deliberate attempt to illegally foul hook fish, which it goes without saying, they have no intention of releasing. This practice of “scratching” or “stroke hauling” is quite rightly not on. However, you can’t blame the lure rod angler who fishes his gear properly and releases any foul hooked fish for the actions of a few idiots, any more than you can consider banning cars because they kill people. A second reason that lure rods are unpopular with some salmon anglers is that a lure angler needs more room to fish his gear. 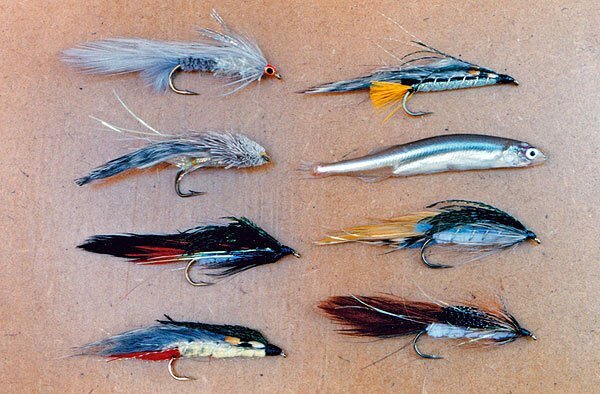 The lure angler swings his weighted line around behind him and out over the water and upstream, rather than casting as one would with a conventional fly fishing outfit. Obviously, this requires more space if a sharp pain in the ear of a neighbouring angler is to be avoided. A minimum of about 15 feet on either side is needed to fish a Canterbury lure rod. 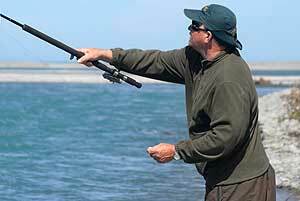 Spinning, on the other hand, allows many anglers to fish in close proximity, with their shoulders almost touching. Thirdly, other anglers don’t enjoy fishing with a Canterbury lure rod. I have spoken to many salmon anglers who have tried it and didn’t like it. The need for continuous casting, combined with the weight of the rod, reel and sinker simply don’t appeal! On a recent trip down to the mouth of the Rakaia River, I noted that of the 100 odd anglers I could see fishing the lower reaches, 90 percent were fishing a Canterbury lure rod. Many were hut owners and locals. Later in the season when good numbers of salmon begin running, the ratio of lure anglers to spin fishermen will drop considerably! The lure rod is the best option when the river is still running high and carrying a bit of colour. Searun brown trout will readily take a fly in fast water near the mouths of Canterbury’s big rivers, as they chase the silveries, and are a welcome bonus when fishing the lure rod. Once you settle into the rhythm of casting with the lure rod it becomes surprisingly easy and enjoyable. You don’t need to cast very far 15-20m maximum. Cast upstream and follow the angle of your line with the rod tip. You can cast overhead style or simply let the lead swing out like a pendulum. Try to keep a reasonably tight line at all times to stay in touch with your lures. When a fish hits lift your rod tip. Even if you only suspect a fish has touched your lure lift your rod tip immediately to set the hook.